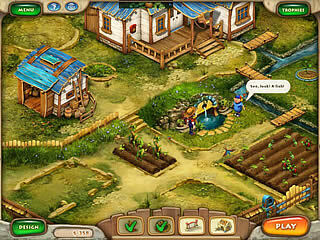 Farmscapes is a new game from Russian game maker Playrix. If you like to build, fix and decorate, the Farmscapes is the game you need! Though it's a quite simple classic match-3 game, it's really engaging! And once started it you won't be able to stop, especially if you have ever played Grandscapes! So, delay all your actions and dive into captivating world of outfitting the farm. The story is about a teenager, who was sent by his parents to his grandfather's farm in order he could spend good time, instead of wasting it by playing video games. Didn't you notice? The irony of it all is that unlike the kid you will spend a lot of time in front of computer. :) Well, let's return to our boy, who is ready to help his grandfather fix the farm. By the way, unlike Gardenscapes, the farm is interactive and there are a lot of things to do: seeding, planting and even rebuilding the farm. There are also trophies, which you can earn if succeed the game. Dive into amazing world of world of outfitting the farm! As for match-3 tasks there is nothing new, but the match-3 boards will appear as mini games. 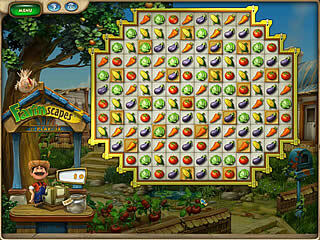 And making match-3 correctly you could sell vegetables, earn money and buy new inventory to repair and renovate the farm. You could even buy a house, if you have enough cash, of course. So, do your best to earn as much money as possible and make best farm ever! There is also a lot of interesting minigames, that you will need to do. And the grandfather and the boy will walk around the farm and talk to each other and to you, letting you know there is a problem and/or what to do. There is also a small task page, which won't let you forget about your task. You can always click on the characters to exchange dialogue between them and with you. And it flattered me, when I was always called by the name, I put in, when the game started. There are also some HOG scenes, but they are too easy as for me. Though a hint recharges every 30 seconds, I'm sure you won't use it at all. The only one thing that annoyed me was too long loading time between scene changes, especially when I came back to the farm after playing the match-3 minigames! Even scrapbook pages between levels couldn't help, as there wasn't much information to read. So, be ready to wait for some time, before starting the next level or you can think of the best moments of the previous level. If you find the tasks simple you can complicate the game by changing the mode, as there are two game modes: timed and relaxed, and you can change it any time you want. You can also choose custom cursor or not. The graphics and music of the game are pretty nice and I can't help laughing, when I clicked the grandson and he said: “What are you clicking on me for?”. It was really funny! Anyway, Farmscapes is a highly captivating game that must be played by all match-3 fans! Grow new trees, plants, flowers, buy new inventory, build new houses and just have fun! This is Farmscapes review. Download this game here.